Yehu studied from 2001-2010 at Tel Aviv University where he obtained a BSc in Life Sciences, MSc in Biochemistry and PhD working on sea anemone toxins. Then he moved to the lab of Ulrich Technau at the University of Vienna to study the evolution of post-transcriptional regulation by small RNAs. Since January 2014 he is an assistant professor(officially called in the Israeli academic system "senior lecturer") at the Department of Ecology, Evolution and Behavior of the Hebrew University of Jerusalem. MicroRNAs are small RNAs which were discovered initially in nematodes at 1993. A decade later they were also identified in most other animals and in plants and were shown to play crucial roles in the development of many species. MicroRNAs act through a protein effector complex which binds to messenger RNAs in a specific manner via annealing of the microRNA to the mRNA target and affect the target expression levels. I initialized during my postdoc in Vienna a study on the roles of microRNAs in N. vectensis development. This study is still underway but we already obtained some very exciting findings regarding the involvement of microRNAs in the regulation of expression levels of proteins involved in development of the anemone. Moreover, we have interesting results regarding the mechanism of action of microRNAs in cnidarians suggesting new and unexpected links between the microRNA pathways of plants and animals see our papers in MBE and Genome Research about this topic. This project also received much hype (and somewhat disinformative presentation!) in popular media such as here, here (in English) and here (in Hebrew). You can also read our new review in Nature Ecology and Evolution here. We also recently published the first evidence for the role of microRNAs and piRNAs in Nematostella development and the role of methylation in stabilizing these small RNAs (see here). This is a study I initialized as a PhD student in Tel Aviv University at the lab of Prof. Michael Gurevitz and I pursued it further in my postdoc as a side project (toxinology is a very sad addiction) and now as a PI. We published several papers about the unusual evolutionary patterns we discovered in sea anemone and scorpion toxins and speculated regarding the factors driving their selection. In general, animal toxins just like immunology-related proteins are a vast playground for strong adaptive selection as they are involved in a never-ending "arms-race" of prey and predator. We also found evidence for an unusual mode of evolution, called "concerted evolution" in the toxin genes of sea anemones. 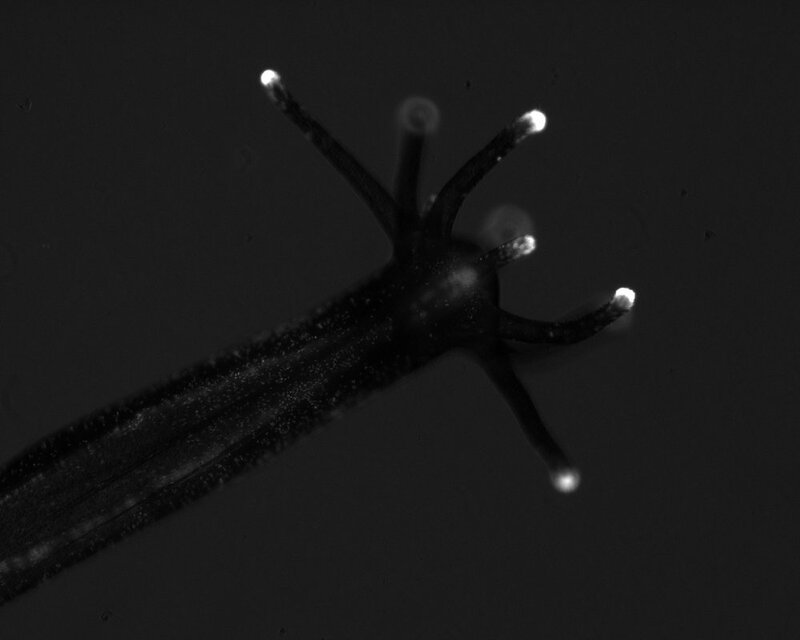 Further, we also show that the expression of neurotoxins happens in several anemone species such as Nematostella not only in nematocytes (stinging cells) but in gland cells (see here). This finding challenges the common statement presented in many invertebrate zoology textbooks that peptide cnidarian toxins are produced exclusively in nematocytes. The ecological shifts which led to toxin expression in different cell populations of closely-related species are of great interest and open the field to eco-evo studies. We also employed proteomic methods for the study of the venom components of Nematosella nematocytes and recently published those results. We are nowadays taking advantage on unique tools such as transgenesis techniques that are available in Nematostella for answering questions about the evolution of venom and venom-producing cells. You can see recent examples here and here. Voltage-gated sodium channels are pivotal components in the conductance of neuronal signals. The unprecedented extent of sequencing of animal genomes in the last few years has enabled us to study in detail the evolution of these channels. We found that these channels have first appeared in unicellular organisms before the split of fungi and animals, but were independently lost in many lineages. Surprisingly cnidarians have a remarkable diversity of channel isoforms, but most of them cannot discern sodium from calcium and potassium. However, Cnidarians do have a selective channel isoform that evolved more than 540 million years ago in the ancestor of all extant cnidarians. The molecular basis of this selectivity is different from that found in selective sodium channels of bilaterians, indicating that sodium selectivity evolved twice independently in animals, probably in order to comply with the rising need for more complex and faster neuronal transmission. In this work we applied both electrophysiological and phylogenetic methods and a first publication came out in Cell Reports. It was followed by a review paper. Nowadays we also study the function of the DEG/ENaC channels of Nematostella. Members of this channel superfamily exhibit an extraordinary level of functional and gating diversity, leading us to wonder and investigate what might have been their original function in basally-branching animals. Our research is generously funded by the Binational Science Foundation (BSF), the European Research Council (ERC), German-Israeli Foundation for Scientific Research and Development (GIF), the Israel Council of Higher Learning, the Israel Science Foundation (ISF) and the Marie Curie Actions of the European Commission. We are grateful for this support. Rubi obtained his MSc in Biomedical Studies and his PhD from the Institute of Dental Sciences of the Hebrew University. He was working in the lab of Doron Steinberg on bacterial biofilm. He is our lab manager and is responsible for everything running smoothly. In addition he is currently studying the evolution of Argonaute proteins and their function in Cnidaria. Yael studied towards her BSc in Life Sciences in the Etgar program for excellent biology students at the Hebrew University. During her 3rd and final year she performed in our lab her final student science project. Since October 2017 she's a master student at the lab working on knocking out specific miRNA genes in Nematostella and on the complementarity requirements of cnidarian miRNA targets. Jose Maria received his MSc from the National Autonomous University of Mexico working on sponge systematics and his PhD from the National University of Ireland, Galway, working with Prof. Grace McCormack on spicule formation in sponges. He joined our group in February 2019 and he studies the evolution and function of cnidarian ion channels of the DEG/ENaC superfamily as a collaborative GIF project with the lab of Prof. Stefan Gründer at RWTH, Aachen. Shefi is an undergraduate student in the program for biology and cognition and in the Etgar program for excellent biology students of the Hebrew University. Shefi joined our lab as an Etgar project student in October 2018 and her project is focused on the recombinant expression of pore-forming toxins from Nematostella. Yaara obtained her BSc in Marine Sciences from the Ruppin Academic Center (Michmoret campus). She studied the phylogeny of ticks in the lab of Yuval Gottlieb-Dror at the Hebrew University's Faculty of Agriculture where she obtained her MSc. She joined our group in April 2014 as a PhD student and her research focus is the function and evolution of Nematostella venom and toxins. Arie joined our lab as a PhD student on November 2015. Before joining our group he obtained his MSc in Biotechnology from Bar Ilan University. He worked there with Prof. Yaron Shav-Tal on the transcriptional activity of single cells by applying live imaging. In our group Arie works on the roles of nematocyte-specific miRNAs and on the functional divergence of Argonaute proteins in Nematostella. Yael received her BSc in Biology from the Hebrew university and her MSc in Marine Biology from Ben Gurion University. She started her PhD in our lab in April 2017 studying the evolution of RNA-based immunity mechanisms in Cnidaria. Yael is co-advised by Prof. Michal Linial from the Department of Chemical Biology at our University. Morani graduated with a BSc in Biotechnology and Marine Biology from Michmoret campus of the Ruppin Academic Center. She joined our group on October 2018 to study the function of toxin-like proteins from Nematostella and their evolutionary transition into venom components. Magda received her PhD with distinction from the Medical University of Lodz in Poland in 2017. In her PhD she studied in the group of Prof. Henryk Witas ancient DNA from human populations in central Europe and its implications on the evolution of human innate immunity. Since February 2018 she's a postdoc in our lab studying RNA-based innate immunity systems in Cnidaria and other animals. Ton obtained his BSc in Marine Biotechnology from the Ruppin Academic Center (Michmoret Campus). He joined our lab in October 2017 as an MSc student to study the function of RIG-I proteins in Nematostella. In December 2018 Joachim submitted his PhD thesis to the Queensland University of Technology (QUT) in Brisbane, Australia. At QUT Joachim worked on the molecular evolution of toxins and other proteins in sea anemones. He joined our group in February 2019 and he studies the evolution of toxins and toxin-like proteins in Nematostella as well as their variation between populations. Abhi received in 2018 his PhD from the National Botanical Research Institute of the Academy of Scientific & Innovative Research, Lucknow, India. In Lucknow, Abhi was working in the group of Dr. Sribash Roy on the variability of miRNA content and function between native populations of Arabidopsis thaliana in India. Since January 2019 he is studying in our group the function of HYL1-Like protein in Nematostella. 20. Sunagar K, Moran Y (2015) The Rise and Fall of an Evolutionary Innovation: Contrasting Strategies of Venom Evolution in Ancient and Young Animals﻿. PLOS Genet. 11: e1005596﻿. Link.